Esven; Can I give you #19 instead? You can't reserve tiles without direct neighbors. 7, 14, 15, 19, 21, 30, 36, 38, 41, 43, 44, 51, 52, 53, 56, 65, 66, 70, 79, 80, 85, 93, 94, 96 and 97. Oh, I did ask if diagonals counted as neighbored for reserving tiles. I'll guess I'll just have to wait for it to be available then. I put a bit of work into the tile but nothing too major. No worries, we can bend the rules in order to avoid wasting your effort. Please go on. Also I'm not entirely sure how the shadow should look for the car but here's my attempt for the tiles next to me. sorry for the delay, occupied days. @Reo: not at all, thanks for the observations, i not usually make isometric pixel art and i not work with limited palettes and the critics do not come bad. I would like tile #15! Here's a WIP. I'm going for a scene from a Past segment in Sonic CD. Here's a WIP of what I have in mind. Done! This took way longer than I had planned. Edit: @Minord: That is much easier to read, good job man! That is QUITE an excellent start with your chosen Tile #25, JerryPie, and such an outstandingly wonderful design of that famous and rather iconic prehistoric foot-powered car (although I would *not* want to get run over by that, ever... quite worse than rush-hour traffic if that happens, if you ask me!). The overall tile so far is just quite awesome so far, with some cacti in the background that is beautifully done as well, perhaps suggesting a desert to come with some dunes above, also. Keep at that amazing pace the way you are doing with Tile #25 indeed, my man!! I really quite like the way you think, Fusionnist, as it would be such a rather wonderful thing for you to do indeed when it comes to pixel-art, I gotta say! After all, you did such an AMAZINGLY brilliant job with #42 as your previous tile, that when I then chose Tile #50 to neighbor yours there, I had to match up the ground closely with yours as beautifully and as seamlessly as ever. That, and our overall 2018 ISO collab project here, are such excellent learning experiences for the both of us in order for us to become much better pixel-artists ourselves... and I am just getting started as well myself, come to think of it!! Keep it up, man, as we would all simply love to see the results of your latest tile here as soon as it is finished. Best of such wonderful success to you in getting it done indeed!!! And great job on that space alien indeed the way you created it in pixel-art form, by the way... I really quite like it so far!! Such a truly impressive job especially on Tile #29, Reo, and one of your rather best tiles yet!!! !! From the canoe, to the canoe-rower, to the grass, to the rapids, to a beaver that just chopped down some wood into those raging waters, and to even the majestic bald eagle that ever-gracefully flies by in its own resplendent glory, you did such a tremendously gorgeous work in simply creating them all as rather vital elements to that latest pixel-art tile you that have just now successfully made in such masterful form overall, and I am quite thoroughly enjoying this one a ton!! ABSOLUTELY PLAIN SUPERB JOB all the way, Reo, and congrats to you as well on that!!! To JerryPie, Fusionnist, jeremy, Theoden, and all the rest of you currently working on getting your own tiles finished, and to Reo as well especially, I wish all of you QUITE a splendid weekend also!! 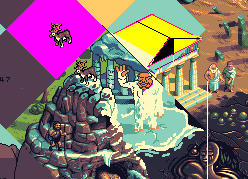 And all the absolute best continued success to you all on this current entire 2018 ISO collab project on PixelJoint, everyone!!! !! @AdigunPolak - Your posts always brighten my day! Thanks for the kind words toward everyone. Btw, I love the tiles you've submitted so far. Done! -- I'm excited to see what's picking up the poor villager. ...and I was particularly rather blown away by it to where it quite easily became my absolute favorite of all the tiles done so far, because 1) it thoroughly kept me and all of us in such great, wildly exciting suspense as to what unfortunate fate awaited one of our villagers from that tile there as more and more tiles were filling up slowly but very, very surely on our 2018 ISO collab map here on PJ; and 2) the overall composition and details there ― including the swamp water, the grass, the resting skull, the cliff, the skeletal bones and glowing eyes from beyond the cliff itself, and most especially the panicked villagers that were trying to run away from whatever rampaging prehistoric creature that was suddenly hunting them down in cold blood, too ―are just TOTAL top-tier brilliance in the way you thoroughly designed that whole entire tile alone, JerryPie, and has clearly launched the gears successfully into motion towards getting this PixelJoint 2018 ISO collab project on the way to a hugest, most spectacular grand success in this overall entirely outstanding “pixel-art creation”-based community right here... and yes, quite definitely, we all are truly in this together in order to make it all happen rather indeed!!! !!! You are always very kind and very positive towards everyone in the PJ community with your expansive comments, which I really appreciate. I am very glad to hear you liked the alien idea. By the way, your tiles really reflect your style and it looks awesome. Thank you ever so very, very much for such a tremendously wonderful comment, Theoden, and quite a phenomenal pleasure to meet you here on PJ as I help to give a ton of positive energy into this community in its entirety, truly... and that MOST DEFINITELY includes me supporting all of you indeed on this year’s current overall ISO collab project especially, too. And such an absolute honor to be with all of you here, let us not forget as well!!! ;) !! As for your own vision for your current tile being that the ancient surviving alien teaches primitive man how to make fire to stay warm and other useful things, that is quite a truly, TRULY outstanding idea for Tile #41 that you are working on indeed, and seriously cultivates such magnificent artistic creativity as rather richly as ever for this amazingly plain wonderful 2018 ISO pixel-art collab that is certainly being built on PJ, for sure!! Rather most splendid idea, Theoden; I love that!!! Wonderful tiles from everyone so far! You sure are a most truest and mighty master in the sheer sacred craft of creating such spectacular-quality pixel tiles as this one, Night, because I am so absolutely very ecstatic that you have now masterfully designed an ancient Roman-inspired building along with the two Greek men that have stumbled into our own prehistoric world that we are making, in which they both are actually quite fascinated by the discovery of soft, active, and ever-viscous melted pitch to be used solely as a rather strong yet ever-purest natural primordial glue for caulking/sealing/repairing their own chariots and ships in order to help them survive and even live better lives quite richly in the days, months, and perhaps so many, many, many countless years ahead, too... what a most splendidly magnificent overall job from you especially on Tile #49, as that tile right there is so wildly damn creative, completely original, and extremely plain rather innovative for the current prehistoric theme that we are facing indeed; THUMBS WAY, WAY UP from me enthusiastically, and I mean that from the very bottom of my deepest heart about your latest completed tile here, quite definitely!!! !!! May Tile #49 successfully be a most stunningly spectacular addition to our current 2018 ISO collab map, that is for sure!!! Update to Tile 33. Still have a bit to do, but I won't have much time to work on it for now. I'm even more amazed at your stonework now. I'm still don't think mine stand up to yours, but it was a pleasure to study your work so closely. This is really an awesome tile Night! Digging it. Can I move my tile from #41 to #74 when Axolotl completes his current tile on #82 please? Since his tile is about space odyssey which is in union with my ancient aliens teaching primitive man how to make fire theme. And I would like to keep the dirt/sand theme he has going there. 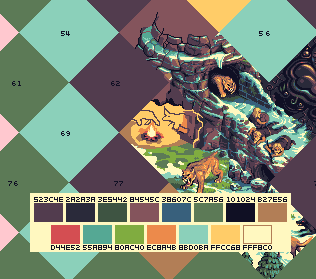 @curiousbeefjerky; you've been here like all the collabs for a long time and you're really improving in pixelling each time you post a tile and this time it seems really amazing! good work. @theoden; sure mate, don't even wait for Axolotl to finish, the one who finishes second will adapt to the other; no big deal. Done, and updated for neighbor tiles. Thanks Geci for shadow help. Tile 11. Took longer than anticipated. Sorry if I interrupted anyone with neighboring tiles. Let me know and I can potentially change things around if I've interrupted anything too badly. Really awesome job once again, you two!!! ! 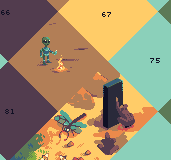 Anyhow here's my attempt at catching up, I added tile 11 from the above post to be able to correctly draw part of the totem thing as it intersects my tile. Had to remove the WIP road because it appears it'll conflict with surrounding tiles :( I also don't know how to continue the dark green shadow around the base of the totem because I have no idea what's casting it (the totem itself appears to have a tiny shadow). As I mentioned @eggy let me know if you need me to adjust anything. I know I kind of came in and changed the context of your tile. @Geci! Love the tile. Wonderfully rendered. @Eggy: the axe-handle was meant to be a sacrificial dagger! Maybe I didn’t make that clear enough. If you want to interpret it differently that’s Another story. @Reo; you see your rocks in the sabertooth tile gave inspiration for at least 4 other tiles. @Eggy: the axe-handle was meant to be a sacrificial dagger! LOL! I actually like how they're both combined into one crazy weapon. Agreed, I love seeing folks taking other people's concepts into different directions than originally considered. I can take the Tile 53. I'd like to try my hand at tile 65, if that's alright. If you want though I could change it lol. But all the same I think it's interesting enough to keep it the way it is. No need to be sorry! It is your tile, do whatever you want with it! May I have 19 please? Here's an update on my tile. Very positive atmosphere, I think the fact that the project is going so good and so fast so far is related to it! Well what can I say, thank you very much Adigun, fun to read! Thanks! Sorry it turned out this way, I was almost done with the tile when I saw you and Fusionnist joined in, so there wasn't much I could do. This is proving to be a challenge hah! I'll be going for #97. Done with 33. Thank you for the kind words Gecimen, they mean a lot to me. These collabs have been a great learning experience, and so many people have helped me get better. I very much appreciate that these exist! May I have tile 79? It's going fast this time, let's not take a year to finish. Wonderful newest tiles so splendidly made, Gecimen and CuriousBeefJerky; I am really just plain amazed and blown away that our entire current ISO collab map here is filling up more and more in record time... here is hoping that this rather damn awesome hot streak continues!!! !! Man, I am *truly* with you on this one, darchangel, because you did such a wonderful-quality tile with such a giant ravenous man-eating plant that lurks below, its mouth and fangs a quite horrific menace for those who steer too close to its gaping, striking maw indeed that had previously munched apart and swallowed up so many, many past victims — which clearly explains the dripping blood around all of its teeth, by the way. That prehistoric Tarzan had really gotta watch himself now if he does not even want to meet a grisly, untimely demise himself!! 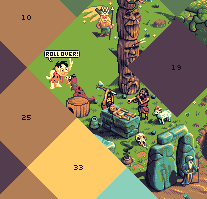 And for your very first try at this year’s ISO collab project on PixelJoint, quite an awesome work you just did on Tile #19, and such a damn superb pixel-art piece here with great detail, at that; keep it up!!! !